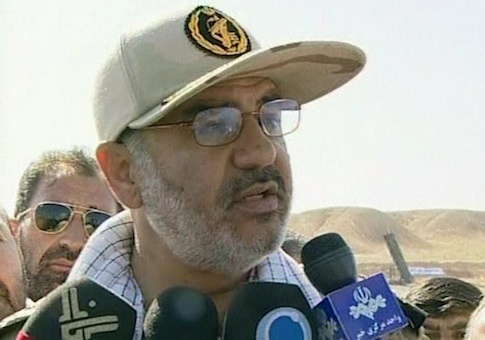 A senior Iranian military commander in charge of the country’s Revolutionary Guard Corps claimed that the 10 U.S. sailors who were recently captured and subsequently released by the Islamic Republic "started crying after [their] arrest," according to Persian language comments made during military celebrations this weekend. Hossein Salami, deputy commander of the IRGC, which is responsible for boarding the U.S. ships and arresting the sailors, claimed in recent remarks, the "American sailors started crying after arrest, but the kindness of our Guard made them feel calm." Hossein went on to brag that the incident provides definitive evidence of the Iranian military’s supremacy in the region. "Since the end of the Second World War, no country has been able to arrest American military personnel," the commander said, according to an independent translation of his Persian-language remarks made Friday during a "martyrs’ commemoration ceremony" in Isfahan. Since the capture and release of the U.S. sailors this week, critics of the Obama administration’s handling of the situation have expressed embarrassment at State Department’s move to profusely thank Iran, despite its release of photos depicting the sailors on their knees with their hands held over their heads. Iranian state television additionally published video purporting to show one of the detained soldiers apologizing to Iran. Meanwhile, during Friday prayers in Iran, a commander of the IRGC unit that detained the U.S. boats and claimed that the American military cowered when faced down by Iranian troops. "I saw the weakness, cowardice, and fear of American soldiers myself. Despite having all of the weapons and equipment, they surrendered themselves with the first action of the guardians of Islam," Ahmad Dolabi, an IRGC commander, said in Persian-language remarks at a prayer service in Iran’s Bushehr providence. "American forces receive the best training and have the most advanced weapons in the world," he added. "But they did not have the power to confront the Guard due to weakness of faith and belief." Dolabi emphasized that the Obama administration formally apologized over the incident, a claim that senior White House official continue to dispute. "We gave all of the weapons and equipment to American forces according to an Islamic manner. They formally apologized to the Islamic Republic," Dolabi said. "Be certain that with the blood of martyrs, the revolution advances. No one can inflict the smallest insult upon our Islamic country."